Time and Conditions: 3 to 4 hours, with some steep sections, you should be in moderate condition….dress accordingly and bring water and snacks. A 10 min. drive up Field Rd (off Hwy 101, past the SCRD offices), and onto an old logging road, takes you into a wonderful, intact, natural forest in the Wilson Creek Watershed. ELF cleared a loop trail that we invite you to use. Look for the banner off Field Rd (past the power lines on the right), drive up the old logging road (or park and walk up), and then look for the trailhead sign. This forest has been used for decades, and centuries by First Nations, to harvest a variety of mushroom species, including the highly-prized Chanterelles. The commercial value of the mushrooms harvested in this area is unknown; however it’s an important value that needs to be recognized. If this forest gets clear-cut the mycelium mats that fruiting mushrooms depend upon will be destroyed. The Chanterelle Forest is threatened with logging by the Sunshine Coast Community Forest (SCCF) – a logging company owned by the District of Sechelt as Cutblock EW28. The Falling Boundary, of the forest to be logged, and Road Centre Line is already surveyed and flagged. Its actually 1 of 6 cutblocks planned to be logged in the Wilson Creek Watershed by SCCF over a ten year period. This wild salmon supporting watershed has very little of its intact older forests left (approx. 95% taken already). We see this area as an important ‘Legacy Forest’ of the Wilson to protect. The forest contains the following bio-diversity: Old-Growth Douglas-fir ‘Vets’, Elk and Bear habitat, average tree age of 140-160 years, dead standing wildlife trees, and a robust growth of various fungi, including Chanterelles and Pines. If you’re a mushroom picker living on the Sunshine Coast, you may have experienced going back to your favourite patch to find it trashed by logging. 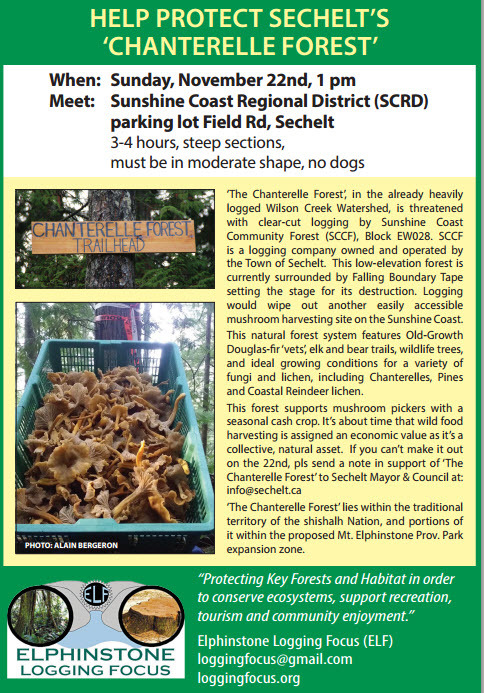 The Chanterelle Forest supports many pickers. It seems that The District of Sechelt assigns Zero Value to this resource and wants it logged. It is clear that the long term economic, recreational and bio-diversity value far outweigh a short-term cash sale. One third of the Cutblock lies within the Mt. Elphinstone Provincial Park expansion area. The Sechelt First Nation has declared its intention to protect this area from logging.